For B Tech E E E 2018 latest Electrical projects list, click the download button. We at Asoka Technologies provide IEEE electrical projects for BTech final year students. We do provide 2018 latest electrical projects at reasonable prices. The project explanation and delivery of simulation results will be very good. Mat lab/Sim u link software is used for developing projects. Also we give rough documentation of the project to the students. In our website, we regularly update project papers related to Electrical and Electronics Engineering for B Tech final year students. Students can select projects from our website or if they have any new idea, they can forward to us. We will let them know the possibility of the idea within a day. If at all students have any doubts regarding project, they don’t need to visit our office every time. Because we can clarify doubts online using Skype, Team Viewer, etc. Because of this online facility, students from anywhere can get the project without visiting office, in short time and clarify doubts at ease and at any time. Once you get registered with us for the project, then we will be with you till the end of the project. We also give guidance for Paper point presentation, viva, etc for the successful completion of the project. We strive hard for the students to be happy in getting the project. Also visit our website www.asokatechnologies.in and blog for more 2018 latest Electrical projects. The paper presents the application of Delta- connected cascaded H-bridge multilevel SVG under unbalanced compensation currents or unbalanced supply voltages. Clustered balancing control for delta-connected SVG can be realized by injecting a zero-sequence current to the delta-loop. But zero-sequence current injection may cause the high peak phase current which may break converter switches. The aim of this paper is to analyze the key factors that affect the maximum output current of the SVG with injecting zero-sequence current and acquire the quantitative relationship between unbalance compensation capability, the unbalance degree of the supply voltage, the initial phase of negative-sequence voltage, the unbalance degree of the compensation current and the initial phase of negative-sequence current. On this foundation, the valid compensation range of delta-connected SVG under unbalanced conditions is obtained. Furthermore, the compensation characteristic of the negative-sequence current is deduced with the certain supply voltage and the influence of supply voltage variation on the maximum output current for SVG is also considered with the certain compensation current. Finally, the correctness of the relevant theoretical analysis is verified by simulation and experiment. In this paper, the effect of unbalanced supply voltage and compensation current on the delta-connected SVG has been analyzed. Injecting zero-sequence current into the delta-loop allows maintaining cluster voltage balancing for the SVG. However, it has been shown that zero-sequence current injection may cause the high peak phase current which may break converter switches. In order to guarantee safe and reliable operation of the delta-connected SVG, whose maximum output current level Imax/Ip is chosen as the standard to measured its unbalance compensation capability and the valid compensation range under unbalanced conditions can also be obtained. The unbalance compensation range of the delta-connected structure is limited by the unbalance degree of the supply voltage, the initial phase of negative-sequence voltage, the unbalance degree of the compensation current and the initial phase of negative-sequence current. The quantitative relationship between unbalance compensation capability and other influence factors derived in this paper can provide a good theoretical basis for the parameter design and device selection of the delta-connected cascaded H-bridge multilevel SVG. In addition, the delta-connected SVG is more sensitive to the unbalance degree of the supply voltage than the unbalance degree of the compensation current， and it will be better way for industrial applications aiming at improving the power quality. The simulation and experimental results further verified the rationality and accuracy of the analysis. Akagi, “Classification, Terminology, and Application of the Modular Multilevel Cascade Converter (MMCC),” IEEE Transactions on Power Electronics, vol. 26, no. 11, pp. 3119-3130, Nov. 2011. Z. Peng and Jih-Sheng Lai, “Dynamic performance and control of a static VAr generator using cascade multilevel inverters,” IEEE Transactions on Industry Applications, vol. 33, no. 3, pp. 748-755, May/Jun 1997. K. Lee, J. S. K. Leung, S. Y. R. Hui and H. S. H. Chung, “Circuit-level comparison of STATCOM technologies,” Power Electronics Specialist Conference, 2003. PESC ’03. 2003 IEEE 34th Annual, 2003, pp. 1777-1784 vol.4. Z. Peng and Jin Wang, “A universal STATCOM with delta-connected cascade multilevel inverter,” 2004 IEEE 35th Annual Power Electronics Specialists Conference (IEEE Cat. No.04CH37551), 2004, pp. 3529-3533 Vol.5. Maharjan, S. Inoue, H. Akagi and J. Asakura, “A transformerless battery energy storage system based on a multilevel cascade PWM converter,” 2008 IEEE Power Electronics Specialists Conference, Rhodes, 2008, pp. 4798-4804. 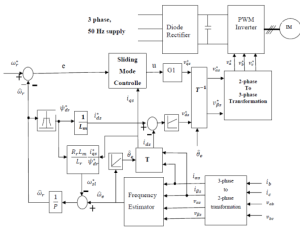 In this paper, a hysteresis current controller with reduced losses for three-phase grid-connected inverter is proposed. In the proposed hysteresis current controller, one of the inverter phase is clamped to the positive or negative inverter buses depending on the polarity of the phase current. Totally, each inverter phase is clamped for the duration of one third of the fundamental output period. As the inverter phase is inactive when the current is the highest, the switching losses are reduced. 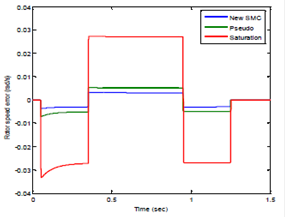 Simulation and experimental results are included to show the effectiveness of the proposed controller. 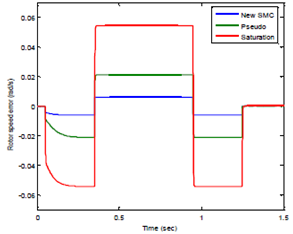 A simple hysteresis current controller with reduced losses has been proposed in this paper. In the proposed current controller, one of the inverter phase is clamped to the positive or negative DC bus, depending on the polarity, when the magnitude of the current is the greatest. 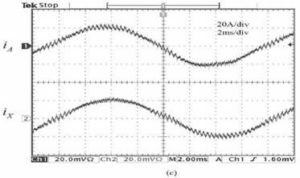 This lead to reduction of the average switching frequency as well as the switching losses. 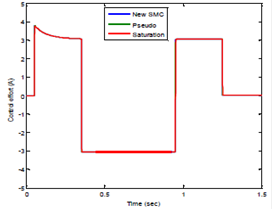 Simulation and experimental results have shown that the proposed hysteresis controller is able to reduce the switching losses without sacrificing the output current waveform. Jain and V. Agarwal, “A Single-Stage Grid Connected Inverter Topology for Solar PV Systems With Maximum Power Point Tracking,” IEEE Trans. Power Electron., vol. 22, no. 5, pp. 1928–1940, 2007. Mohseni and S. M. Islam, “A new vector-based hysteresis current control scheme for three-phase PWM voltage-source inverters,” IEEE Trans. Power Electron., vol. 25, no. 9, pp. 2299–2309, 2010. 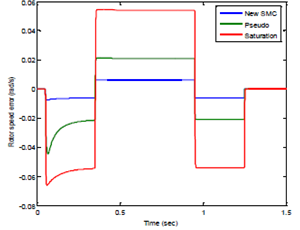 P. Kazmierkowski and M. A. Dzieniakowski, “Review of currentregulation techniques for three-phase PWM inverters,” Proc. IECON’94 – 20th Annu. Conf. IEEE Ind. Electron., vol. 1, pp. 567–575, 1994. Zhang and H. Lin, “Simplified model predictive current control method of voltage-source inverter,” 8th Int. Conf. Power Electron. – ECCE Asia, pp. 1726–1733, 2011. C. Hua, C. W. Wu, and C. W. Chuang, “A digital predictive current control with improved sampled inductor current for cascaded inverters,” IEEE Trans. Ind. Electron., vol. 56, no. 5, pp. 1718–1726, 2009. 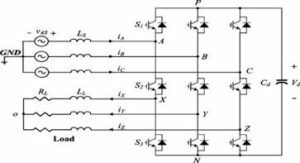 This paper proposes a novel three-phase nine-switch ac/ac converter topology. This converter features sinusoidal inputs and outputs, unity input power factor, and more importantly, low manufacturing cost due to its reduced number of active switches. The operating principle of the converter is elaborated; its modulation schemes are discussed. 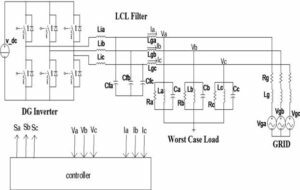 Simulated semiconductor loss analysis and comparison with the back-to-back two-level voltage source converter are presented. Finally, experimental results from a 5-kVA prototype system are provided to verify the validity of the proposed topology. CIRCUIT DIAGRAM: Fig: 1 B2B 2L-VSC. Fig. 3. Measured rectifier and inverter waveforms (CF-mode operation). (a) Input and output voltages. (b) Voltage spectrum. (c) Input and output currents. Fig. 4. Measured waveforms and spectrum (VF mode operation). (a) Input and output voltages. (b) Spectrum. Fig. 5. Measured waveforms when the inverter output frequency has a step increase from 30 to 120 Hz, while the rectifier input frequency remains at 60 Hz. (a) Input and output voltages. (b) Input and output currents. A novel nine-switch PWMac/ac converter topology was proposed in this paper. The topology uses only nine IGBT devices for ac to ac conversion through a quasi dc-link circuit. 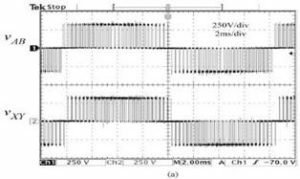 Compared with the conventional back-to-back PWM VSC using 12 switches and the matrix converter that uses 18, the number of switches in the proposed converter is reduced by 33% and 50%, respectively. The proposed converter features sinusoidal inputs and outputs, unity input power factor, and low manufacturing cost. The operating principle of the converter was elaborated, and modulation schemes for constant and VF operations were developed. Simulation results including a semiconductor loss analysis and comparison were provided, which reveal that the proposed converter, while working in CF mode, has an overall higher efficiency than the B2B 2L-VSC at the expense of uneven loss distribution. However, the VF-mode version requires IGBT devices with higher ratings and dissipates significantly higher losses, and thus, is not as attractive as its counterpart. Experimental verification is carried out on a 5-kVA prototype system. Wu, High-power Converters and AC Drives. Piscataway, NJ: IEEE/Wiley, 2006. Singh, B. N. Singh, A. Chandra, K. Al-Haddad, A. Pandey, and D. P. Kothari, “A review of three-phase improved power quality AC– DC converters,” IEEE Trans. Ind. Electron., vol. 51, no. 3, pp. 641–660, Jun. 2004. 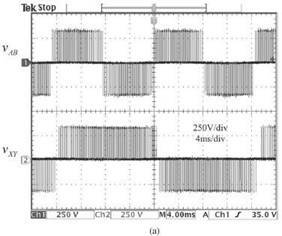 Blaabjerg, S. Freysson, H. H. Hansen, and S. Hansen, “A new optimized space-vector modulation strategy for a component-minimized Voltage source inverter,” IEEE Trans. Power Electron., vol. 12, no. 4, pp. 704–714, Jul. 1997. L. A. Ribeiro, C. B. Jacobina, E. R. C. da Silva, and A. M. N. Lima, “AC/AC converter with four switch three phase structures,” in Proc. IEEE PESC, 1996, vol. 1, pp. 134–139. The matrix converter is an array of controlled semiconductor switches that connects directly the three-phase source to the three-phase load. This converter has several attractive features that have been investigated in the last two decades. In the last few years, an increase in research work has been observed, bringing this topology closer to the industrial application. This paper presents the state-of-the-art view in the development of this converter, starting with a brief historical review. An important part of the paper is dedicated to a discussion of the most important modulation and control strategies developed recently. Special attention is given to present modern methods developed to solve the commutation problem. Some new arrays of power bidirectional switches integrated in a single module are also presented. Finally, this paper includes some practical issues related to the practical application of this technology, like overvoltage protection, use of filters, and ride-through capability. Fig. 2. Typical waveforms. (a) Phase output voltage. 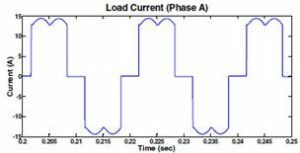 (b) Load current. Fig. 3. Illustrating maximum voltage ratio of 50%. Fig. 4. Illustrating voltage ratio improvement to 87%. Fig. 5. 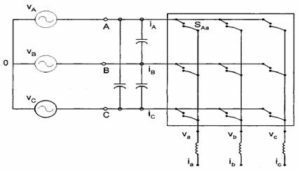 Line-to-line voltage and current in the load with the indirect method. 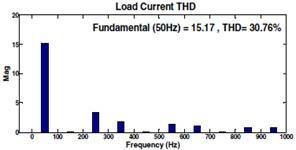 Output frequency of 50 Hz. After two decades of research effort, several modulation and control methods have been developed for the matrix converter, allowing the generation of sinusoidal input and output currents, operating with unity power factor using standard processors. The most important practical implementation problem in the matrix converter circuit, the commutation problem between two controlled bidirectional switches, has been solved with the development of highly intelligent multistep commutation strategies. The solution to this problem has been made possible by using powerful digital devices that are now readily available in the market. 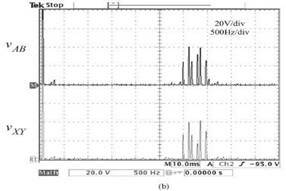 Gyugi and B. Pelly, Static Power Frequency Changers: Theory, Performance and Applications. New York: Wiley, 1976. Brandt, “Der Netztaktumrichter,” Bull. ASE, vol. 62, no. 15, pp. 714–727, July 1971. Popov, “Der Direktumrichter mit zyklischer Steuerung,” Elektrie, vol. 29, no. 7, pp. 372– 376, 1975. Stacey, “An unrestricted frequency changer employing force commutated thyristors,” in Proc. IEEE PESC’76, 1976, pp. 165–173. Jones and B. Bose, “A frequency step-up cycloconverter using power transistors in inverse-series mode,” Int. J. Electron., vol. 41, no. 6, pp. 573–587, 1976. Intentional islanding describes the condition in which a microgrid or a portion of the power grid, which consists of a load and a distributed generation (DG) system, is isolated from the remainder of the utility system. In this situation, it is important for the microgrid to continue to provide adequate power to the load. Under normal operation, each DG inverter system in the microgrid usually works in constant current control mode in order to provide a preset power to the main grid. When the microgrid is cut off from the main grid, each DG inverter system must detect this islanding situation and must switch to a voltage control mode. In this mode, the microgrid will provide a constant voltage to the local load. This paper describes a control strategy that is used to implement grid-connected and intentional-islanding operations of distributed power generation. This paper proposes an intelligent load-shedding algorithm for intentional islanding and an algorithm of synchronization for grid reconnection. Fig. 1. Schematic diagram of the grid connected inverter system. Fig. 2. From grid-connected to intentional-islanding operation. Fig. 3. Synchronization for grid reconnection. Fig. 4. Phase voltage (top) without and (bottom) with the synchronization algorithm. Fig. 5. Phase voltage Va without the load-shedding algorithm. Fig. 6.Phase voltage Va with the load-shedding algorithm. Through this paper, the control, islanding detection, load shedding, and reclosure algorithms have been proposed for the operation of grid-connected and intentional-islanding DGs. A controller was designed with two interface controls: one for grid connected operation and the other for intentional islanding operation. An islanding-detection algorithm, which was responsible for the switch between the two controllers, was presented. The simulation results showed that the detection algorithm can distinguish between islanding events and changes in the loads and can apply the load-shedding algorithms when needed. The reclosure algorithm causes the DG to resynchronize itself with the grid. 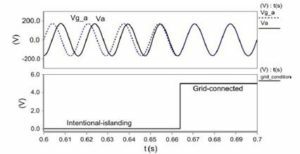 In addition, it is shown that the response of the proposed control schemes is capable of maintaining the voltages and currents within permissible levels during grid connected and islanding operation modes. The experimental results showed that the proposed control schemes are capable of maintaining the voltages within the standard permissible levels during grid connected and islanding operation modes. In addition, it was shown that the reclosure algorithm causes the DG to resynchronize itself with the grid. Jayaweera, S. Galloway, G. Burt, and J. R. McDonald, “A sampling approach for intentional islanding of distributed generation,” IEEE Trans. Power Syst., vol. 22, no. 2, pp. 514– 521, May 2007. M. Guerrero, J. C. Vásquez, J. Matas, M. Castilla, and L. García de Vicuña, “Control strategy for flexible microgrid based on parallel lineinteractive UPS systems,” IEEE Trans. Ind. Electron., vol. 56, no. 3, pp. 726–736, Mar. 2009. Carpaneto, G. Chicco, and A. Prunotto, “Reliability of reconfigurable distribution systems including distributed generation,” in Proc. Int. Conf. PMAPS, 2006, pp. 1–6. IEEE Recommended Practice for Utility Interface of Photovoltaic (PV) Systems, IEEE Std 929-2000, 2000, p. i. 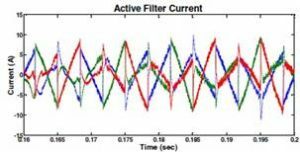 Along with increasing demand on improving power quality, the most popular technique that has been used is Active Power Filter (APF); this is because APF can easily eliminate unwanted harmonics, improve power factor and overcome voltage sags. This paper will discuss and analyze the simulation result for a three-phase shunt active power filter using MATLAB/SIMULINK program. This simulation will implement a non-linear load and compensate line current harmonics under balance and unbalance load. 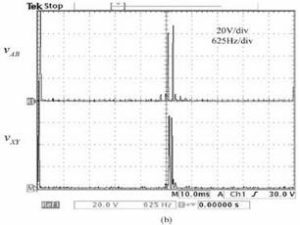 As a result of the simulation, it is found that an active power filter is the better way to reduce the total harmonic distortion (THD) which is required by quality standards IEEE-519. Fig.1. Diagram illustrating component of shunt connected active filter with the waveform showing cancellation of harmonics from an ASD load. The Increasing usage of non-linear load in electrical power system which will produce the current and voltage harmonics and associate harmonics problem in power system become more serious and directly affecting the power quality. Conventional way of harmonics elimination by using passive filter might suffer from parasitic problem. 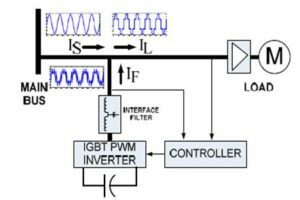 It has been shown that three phase active filter based on p-q theory can be implemented for harmonic mitigation and power factor correction. Harmonics mitigation carried out by the active filter meets the IEEE-519 standard requirements. Emadi, A. Nasiri, and S. B. Bekiarov, “Uninterruptible Power Supplies and Active Filter”, Florida, 2005, pp. 65-111. W. Hart, “Introduction to Power Electronics”, New Jersey, 1997, pp. 291-335. McGranaghan, “Active Filter Design and Specification for Control of Harmonics in Industrial and Commercial Facilities”, 2001. Round, H. Laird and R. Duke, “An Improved Three-Level Shunt Active Filter”, 2000. Lev-Ari, “Hilbert Space Techniques for Modeling and Compensation of Reactive Power in Energy Processing Systems”, 2003. Induction Motors have been used as the workhorse in the industry for a long time due to its easy build, high robustness, and generally satisfactory efficiency. However, they are significantly more difficult to control than DC motors. One of the problems which might cause unsuccessful attempts for designing a proper controller would be the time varying nature of parameters and variables which might be changed while working with the motion systems. One of the best suggested solutions to solve this problem would be the use of Sliding Mode Control (SMC). 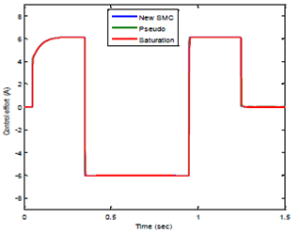 This paper presents the design of a new controller for a vector control induction motor drive that employs an outer loop speed controller using SMC. Several tests were performed to evaluate the performance of the new controller method, and two other sliding mode controller techniques. From the comparative simulation results, one can conclude that the new controller law provides high performance dynamic characteristics and is robust with regard to plant parameter variations. 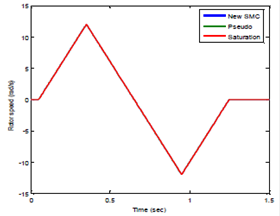 In this paper, new technique to reduced chattering for sliding mode control is submitted to design the rotor speed control of induction motor. 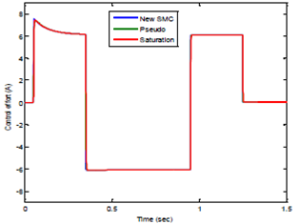 To validate the performances of the new proposed control law, we provided a series of simulations and a comparative study between the performances of the new proposed sliding mode controller strategy and those of the Pseudo and Saturation sliding mode controller techniques. The sliding mode controller algorithms are capable of high precision rotor speed tracking. From the comparative simulation results, one can conclude that the three sliding mode controller techniques demonstrate nearly the same dynamic behavior under nominal condition. Also, from the simulation results, it can be seen obviously that the control performance of the new sliding mode controller strategy in the rotor speed tracking, robustness to parameter variations is superior to that of the other sliding mode controller techniques. Wade, M.W.Dunnigan, B.W.Williams, X.Yu, ‘Position control of a vector controlled induction machine using slotine’s sliding mode control’, IEE Proceeding Electronics Power Application, Vol. 145, No.3, pp.231-238, 1998. I.Utkin, ‘Sliding mode control design principles and applications to electric drives’, IEEE Transactions on Industrial Electronics, Vol.40, No.1, pp. 23-36, February 1993. K.Namdam, P.C.Sen, ‘Accessible states based sliding mode control of a variable speed drive system’, IEEE Transactions Industry Application, Vol.30, August 1995, pp.373-381. Krishnan, ‘Electric motor drives: modelling, analysis, and control’, Prentice-Hall, New-Jersey, 2001. J.Wai, K.H.Su, C.Y.Tu, ‘Implementation of adaptive enhanced fuzzy sliding mode control for indirect field oriented induction motor drive’, IEEE International Conference on Fuzzy Systems, pp.1440-1445, 2003.